Seaford Town Council has been overwhelmed with the level of interest in the new luxury beach huts under construction at Bönningstedt Parade on Seaford’s amazing seafront. Interest in the first 20 Beach Huts has been very high with half being sold off plan. However, many potential purchasers have expressed an interest in seeing a beach hut fitted out. A open day has therefore been organised for visitors to come and see a fitted out beach hut on Saturday the 2nd September. It will be open from 10am – 2 pm with someone on hand to answer any questions. These twenty beach huts are the first of three phases in the development. All of the initial Huts are to be sold at £45,000 each to fund the rest of the Seafront Development Plan. Later phases will include huts that will be available for hire, some of which will be wheelchair friendly. It is highly likely that a price increase will be in place for the second phase of 20 beach huts planned for 2018, and a further increase for the third phase in 2019, so this is a perfect opportunity to purchase one at the lower price in this first phase. 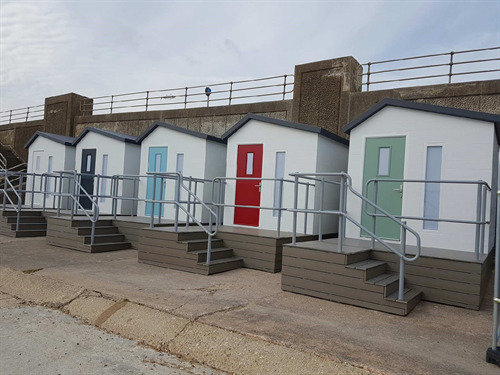 The beach huts are an integral part of the £2.3 million seafront development project - 7 Beach Huts have now been installed along the eastern elevation of Bönningstedt Parade on Seaford seafront with two added every week over the next few weeks. Manufacturing has been to the highest standard possible using locally sourced high-quality Fibreglass G.R.P. instead of standard wood, weatherproofed guard rails, and it comes with long term guarantees. The transparent panels in the huts are made of the same resilient material used around the pit to protect the audience in TV’s Robot Wars. The doors will be in various shades, bringing some welcome colour to the area. A low-level sea defence ground secured concrete wall will be constructed later this year to give added protection to the promenade area in front of the beach huts. To keep up to date with developments for Seaford seafront, and the proposed second and third phases of the beach hut installation, visit the Seafront Development Page of the website. First 5 Beach Huts installed at Bönningstedt Parade, Seaford Seafront.